Search for all "DNA polymerase lambda"
Rabbit anti Human DNA polymerase lambda. KLH conjugated synthetic peptide between 546~575 amino acids from the C-terminal region of human DNA polymerase lambda. This gene encodes a DNA polymerase. DNA polymerases catalyze DNA-template-directed extension of the 3'-end of a DNA strand. This particular polymerase, which is a member of the X family of DNA polymerases, likely plays a role in non-homologous end joining and other DNA repair processes. Brown, J.A., et al. J. Mol. Biol. 395(2):282-290(2010). van Loon, B., et al. Proc. Natl. Acad. Sci. U.S.A. 106(43):18201-18206(2009). Garcia-Diaz, M., et al. Nat. Struct. Mol. Biol. 16(9):967-972(2009). 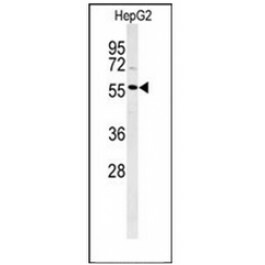 This antibody recognizes Human DNA polymerase lambda (C-term).